We offer exclusive and customized tours through the European Astronaut Centre. 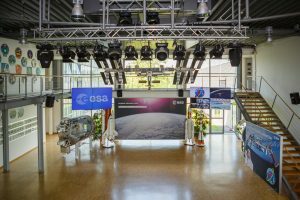 Tours will give you an unforgettable insight in the current missions of the European Space Agency to the International Space Station, explain the European Astronaut Centre and leave you with first-hand impressions of this unique location. Depending on the availability you might be able to set foot in Europes only Astronaut Training Hall housing 1:1 Mockups of ESAs Cargo Supply Vessle and the Columbus Space Laboratory. Content and length of the tour can be tailored to your needs and schedule.